I got to spend some time with the culinary wonder-woman. Cat Black: Tell me about your professional background, how did you start out? Maricel Presilla: I am a medievalist. I am Cuban born. Born in Santiago de Cuba, which is the eastern part of Cuba. I left Cuba like many Cubans who didn’t like the Castro regime. I arrived in the US in 1970 and went to Spain, to study medieval history. CB: Where in Spain did you do that? MP: The University of Valladolid, I studied medieval history there, went back to the States, got my PHD in medieval Spanish History, and taught, at both NYU and at Rutgers. But I was always cooking. It was my hobby, and it became my profession, which is very dangerous with me, turning hobbies into professions! CB: So not just cooking at home, cooking for other people? MP: Professionally, I had started training because I liked it. Then one thing led to the other and I became very busy. I was a chef in New York and also doing a lot of consulting. I was invited to multiple conferences and culinary events, and it was obvious to me that I really liked that world. So when the time came for me to make a decision, I was looking at moving to another state to another university to teach there, but I made the decision to stay put and to develop food. I made a conscious decision to be a food person. CB: Why did you decide to get so focused on chocolate? MP: I had already contracts for books and I started travelling through Latin America to do research. Since part of my family in Cuba, on my paternal side, are cacao farmers, obviously anything to do with cacao interests me. And I always looked at cacao as another food. CB: Not as just a sweet. MP: Not as a separate thing. For me chocolate and cacao were like other Latin American ingredients. So it was natural that when I went to study the food of the area I would stumble upon a cacao farm. Things led me to work with a chocolate company from Venezuela called El Rey. I became very involved with them and the marketing of their products for the United States market. At the time it was very new. Only Valrhona had used percentages, and kind of vague descriptions of where the cacao beans came from. What was obvious to me was that I was drawn to cacao and that I was knowledgeable enough, and I started writing about it. CB: So you were writing more and more about cacao as it was so natural to you. MP: What happened is that although Valrhona talked about percentages and origins, and in kind of a loose manner where the cacao came from, it was very vague. But El Rey, the company with which I worked, used Carenero Superior, a cacao from one region of Venezuela called Barlovento. So it was single origin at its best and their message was very precise. MP: Yes. So my job was to essentially to help them position those chocolates from Venezuela in the United States. We created the ‘Ruta del Cacao’, the ‘chocolate route’. It was the first chocolate tourism, although it was not tourism because it was meant as a working trip for professionals. We invited chefs and writers from different areas of the USA to go to Venezuela. It was incredibly lavish; we flew private planes all over Venezuela. MP: Learning about Venezuelan cacao. Groups as large as sixteen people, including the top chefs of the US. 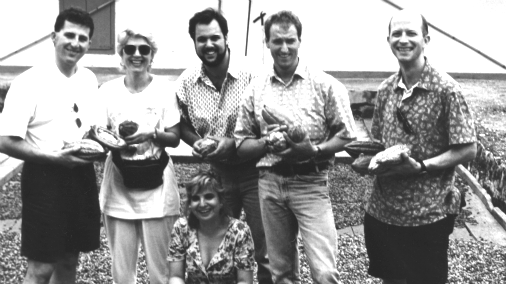 Bill Yosses who is now the pastry chef of the White House, Francois Payard, a very famous French pastry chef, Nancy Silverton who is a very famous chef in California, Elizabeth Falkner, Larry Burdick, they all came with us. They had never seen cacao, they had never seen a plantation. They saw for the first time with us. Then we would go to the factory in Barquisimeto. 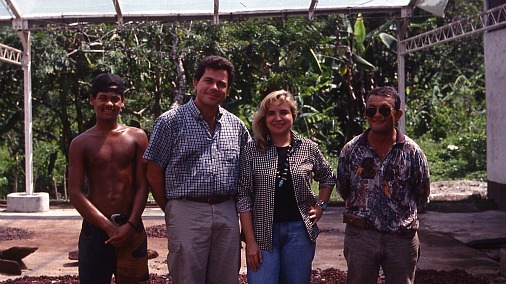 Maricel, kneeling, leading the Ruta del Cacao, with Bill Yosses, far right. CB: To see how it was made. MP: And then they cooked in Venezuela with Venezuelan chocolate. When they went back they were missionaries of El Rey, because they really understood the company: they understood that it was fantastic chocolate. They had never tasted something so complete. Then they put El Rey on their menus and became like our ambassadors in all the different cities in the US. Then my next job was to go to those cities and give talks. In fact we did the talks to benefit a group of women cooks and chefs. But at the same time we were spreading the word about single origin chocolate. Up to that point, except for the connoisseurs nobody paid any attention to Venezuela. Since I was the one doing these talks, I was the one helping spread the word about Venezuela and about single origin, which was not known at the time. These are two things I can tell you that I did. MP: For instance, I would do a talk with Harold McGee who is a food scientist, and we would talk about Venezuelan single origin, we would talk about the cacao-growing regions and different flavours in Venezuela. CB: So you have been hugely instrumental for both professionals and then consumers in discovering the best in chocolate. MP: First of all, my talks were really seminal. It was all so virginal at the beginning. There was no one making chocolate with Porcelana, no one was doing any of this (referring to the International Chocolate Awards which was the backdrop to our meeting). So it was only El Ray doing something good from Venezuela at the time. And what resulted spearheaded what was almost a stampede of people going to Venezuela to get cacao. MP: When I wrote my book, it was the first book to have percentages in the recipes. The first edition had percentages. And at that time no one said use a 70% chocolate for this recipe! CB: So that was really pioneering. MP: Nobody had done it. Recipes instructed cooks to use bittersweet, semi-sweet chocolate, but nobody said use this particular chocolate, with this particular percentage, for this particular recipe. CB: I remember as a child finding that complicated, because my mother was born in Boston and we have some American cookbooks. And when you read a descriptive term like bittersweet or semisweet you never knew how to interpret it for what we had in England. MP: So my book was a first. 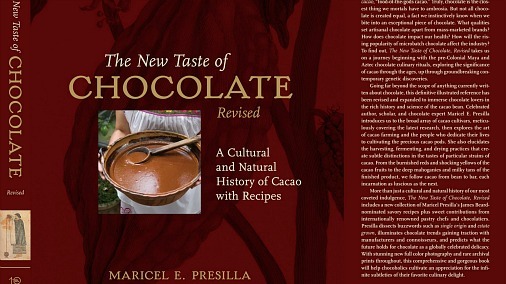 It was ‘The New Taste of Chocolate: A Cultural and Natural History of Chocolate, with Recipes’. My book was also the first to have reference to varieties. I went to the place where Porcelana grows, and I photographed Porcelana, and I tasted Porcelana, so I talked about what I had discovered. I discovered all that, and I shared it! Then the second book, which was a new edition that came out in 2009, has all the new research. The new classifications of cacao varieties are very recent. We don’t talk about Forastero versus Criollo anymore. We talk about many genetic clusters, and in fact the number has reached thirteen in the last year. And I also talk about the latest archaeological discoveries dating cacao and drinks made with cacao. CB: So the use of it from the Aztecs? MP Even beyond that, to the pre-Mayan peoples. So the second book has all the latest discoveries, including the most current medical research. It really covers things that I didn’t cover in the first book because the research was so new. Things were beginning to happen, but now it is an explosion! The changes are dramatic, between 2000, when I wrote the first edition, and 2009 when I wrote the second. I am working on a third book now that will also bring to light the culture of the cacao-growing regions of Latin America. CB: So to summarise what has happened since you started, it is a mushrooming of interested and knowledge. And what do you think is going to happen next? MP: We are still exploring themes. Single origin is going to be a big theme for a long time. But we are going to see a resurgence of blends soon, inevitably. But the single origin craze is still strong. There will be more medical materials, more genetic discoveries. Those still haven’t percolated and people still talk about the old positions, but there is going to be a lot more. CB: I see more and more small makers who are really focused on the beans. MP: Every day it gets more difficult to get really exceptional beans. As a result of that, which is really interesting, you are going to see single origin bars made with bulk cacao. 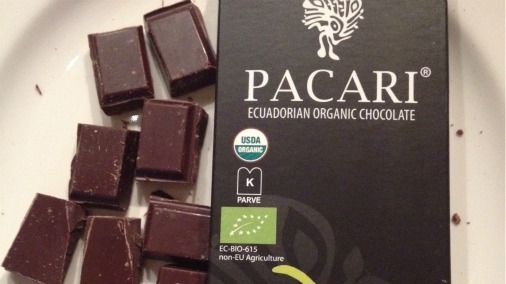 You are going to see a single origin bar made with Ivory Coast, which is a bulk cacao. For example Valrhona now has a Ghana bar. So the claim is that this is chosen very carefully. But it is still bulk, and you are going to see a lot of that. CB: People making those kinds of claims around beans that are not special enough to be focused on. MP: They will find something special to say; like that this is from a particular farmer. The marketing machinery will work. CB: The story and the marketing will be there, even if it is not so special to eat. MP: Yes, because the truth is it is very hard to get special beans, it is not simple. Also you are going to find more competitions. This (The International Chocolate Awards 2012) is the first one of this breadth in the world, truly. CB: So what will be next for The International Chocolate Awards, which is held for the first time this year? MP: What this is doing is amalgamating people from all over in to one community. Because we are reaching out to makers, and the Grand Jury is international, Italian, German, American, British, French, Canadian, Latin American. That is very healthy, and it is the creation of a chocolate community. I also think it is very good for England. Because I think England is poised to take a starring role, perhaps like the French Salon. CB: You mean the Salon du Chocolat? CB: I found the Salon du Chocolat great fun, but very generalist. MP: Yes and here the English have a great opportunity to become a centre of interest for chocolate. CB: To be more specialist and more focused on flavour? I found the professional Salon very interesting, and a phenomenal display of technical ability. But the main Salon was for the most part an exhibition of brands. Although there were some interesting things. MP: I think the UK has a real chance. Through these awards, the final rounds of which are going to be announced during Chocolate Week. It can grow, it can become really important. I am not saying that it will replace the Salon, but it could be of that same grand scale. Why not? CB: Grand in terms of importance, but maybe not in terms of physical size. MP: What has been done here has been very carefully organised. You saw the materials, you saw what the judges got, you saw how the forms were (this is all available to view online for total transparency of process), and you saw what we bring to bear and the kinds of chocolate that we are tasting. And I think that we have the opportunity to make this something really important. CB: The phrase that Martin used (Martin Christy co-founder of the awards) used the phrase “controlled subjectivity” to describe the judging process. I think that is a good phrase and a good concept. MP: The kinds of judging forms, and the kinds of feedback, make for controlled subjectivity. I think what is incredible is the pool of talent and expertise. For me this is great because I am learning through this process and we are pointing to the next stage. And I say this without any hint of modesty, I feel the Grand Jury had a seminal impact in this movement. MP: I am very proud of it. CB: On a more personal note, were you always a foodie, did you have a foodie childhood? MP: I come from a family of excellent cooks. My mother was not a great cook but she liked to eat very well and she was very finicky. But her sisters were incredible cooks. So I come from an old, traditional, upper-middle class family, with women who ruled their kitchens fantastically well. CB: Both my mother and my father are fantastic cooks. MP: My father is a great cook. He is an artist, a painter and a sculptor, but he likes to cook larger than life dishes, like a huge crab stew. On my paternal side my grandmother was an extraordinary cook and my aunts were great cooks as well. So I grew up in an environment where for Sunday lunch everybody would gather and the kitchen activities would be fascinating to me. I learnt how to do a lot of things in the kitchen. I wasn’t a foodie in the sense that I was thinking about food 100%. That happened later, and that happened in exile. It happened when I started defining myself through memories of the foods that I left behind. It happened to me when I was in the US thinking; “this pork doesn’t taste the same”. CB: Tastes are so linked to your identity. For myself as a mixed race person, growing up with Indian food, Russian specialities and parents cooking from that diverse heritage, I found that when I was older and amongst English friends I was not eating what I knew. I started to care more about the things that I had grown up with. MP: That is what happened to me, and I started to realise how much I knew about the origin of the foods I liked. When people started asking me about the foods of Cuba I knew so much about the history, because obviously I am a historian, so everything I do has a component of history. For me the unexamined food is not worth eating. Nor the unexamined chocolate. CB: The unexamined life it not worth living, it is the same thing. MP: I examine everything. If I know the history of it that is the best, that is exactly what I want, that is who I am. If I give you a recipe I will probably give you a history of that recipe. I will flesh it out. If I know the origins, I will talk about it and write about it. CB: So what are you working on next? MP: The good thing about me right now is that everything that I do is meshed. As I said I don’t think of chocolate and cacao as separated from the food of Latin America, it is our food, and we gave it to your guys outside! This is how I feel. CB: You are working on another big book now. MP: This book is all about Latin America, it has a chocolate section. 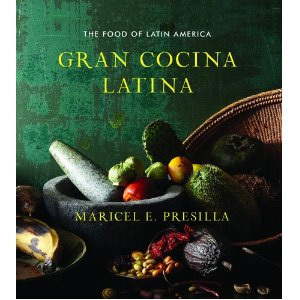 It is called Grand Cocina Latina and it is coming out October 1st. This is a big book. But I am also working on another chocolate book, another cacao book, I am growing peppers, I am doing a number of other things. 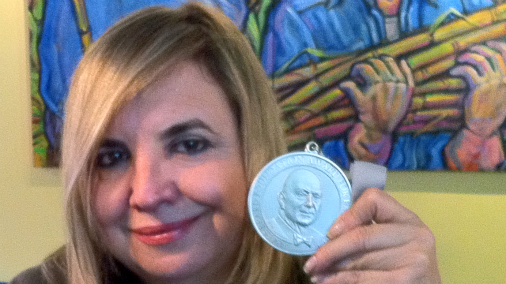 CB: Tell me about The James Beard Award you won this year. MP: That was an award from the James Beard Foundation, an organisation dedicated to James Beard, the godfather of American cooking. I received the award the year they were celebrating their 25th anniversary. They have come a long way. Their awards are now the equivalent of the Oscars to the food world in the US. CB: Your award was not for a particular book, was it for services to the industry? MP: No, it was for best chef in my area, which is Mid-Atlantic. That covers Virginia, Delaware Maryland, Washington DC, the capital, Philadelphia, Pennsylvannia and New Jersey. CB: So a big region, and one full of foodie people. MP: It’s a gigantic region and there are five finalists. I was competing with the DC guys, from the capital, with well established, lavishly funded restaurants. I had been nominated four times before, this was my fifth nomination. I had been nominated for journalism awards before. So this was my sweet victory. MP You know, I am the first woman in my state, and the first Latin woman to have won in that category. But I have already been first in other important things. I was the first Latin female chef to have been invited as a guest chef at the White House. So I cooked in 2009 for President Obama. I cooked for four hundred guests and I was the first Latin Woman chef ever in the history of the White House to do so. I can say that the first complete Latin American menu served at the White House was mine. CB: That is very cool! MP: So I cooked at the White House and that is my claim to fame. I did seven sweets, out of which six were chocolate! And seven savouries. Out of the six sweets I had a colonial drink, which was spiced with hot pepper and it was coloured with achiote seeds. It is a recipe from 1644, a mixture of ancient pre-Colombian and colonial ingredients. MP: I did Latin American based chocolate recipes. I didn’t do anything that was not Latin American, and I used cacao beans and spice powders. CB: Can you tell me a little about what you love most about chocolate, which seems to me to be a passion for chocolate that is true to the character of its bean? MP: I have to say that I admire the craft of the chocolate maker. I worked with a man named Robert Steinberg, he was the co-founder of Scharffen Berger Chocolate in the US, who did blends. He was a physician, who had left medicine and went to Lyon and trained with Bernachon there. He loved the idea of the blend, he loved the craft of creating a chocolate with different beans. I have to say that I had come from the background of single origin, but I learnt to appreciate what he was doing. So I do admire a great blend. But it is not fashionable any more, that is the trend. CB: That can change if people do things really well. MP: Yes, but I believe that the single origin is important because we are just getting to know origins. It used to be impossible to taste a Porcelana, or other rare Criollo beans like Gasare. But I predicted it would happen and now there are chocolates made from those beans. It is an educational process. So people need to know what the cacao from the Dominican Republic is like, what individual regions are like, or what a Porcelana is like. CB: In the way that they have a knowledge of what particular grapes taste like in wine. They know what to expect of a Chardonnay or a Sauvignon. MP: They also know the nuances of a Chardonnay grown in a cool area, or what a Cabernet does in a cool area or a warm area. They know all these things. CB: So until we have much greater knowledge we can’t move on from that. MP: Yes we are still missing something. For example people didn’t know that a Nicaraguan might have a black olive flavour. When you taste it you can immediately detectt that. CB: Yes I love that about Nicaraguan chocolate, I love that flavour note. MP: It is very interesting, but somebody might mistake that as a defect. Somebody might say that the ideal bean should be very round and have a lot of cherry notes, dried fruits and nuts. The simple notes of a Porcelana, for instance, are very nutty. CB: Yesterday you described a Porcelana like a Macadamia nut, clean, mild and nutty. MP: Exactly, so when you taste something like that you start learning. But we haven’t gotten to the point where that knowledge is widespread. So we need to exhaust this exploration, which is a single origin exploration. Organisations like The International Chocolate Awards 2012 are very important, because of the fact that this is open to a variety of judges, who do not come from the same food background. We are all getting an education. The way this has been organised is so smart and so rational. We are learning as we taste. This is not just a mindless exercise of filling out forms. CB: To change the subject entirely, Monica (Meschini, a fellow Grand Jury Member) told me something beautiful about your name. MP: Yes it divides into Mar-i-cel, which is sea and sky. It is a Catalan name. CB: So you encompass the world! MP: I am the world, or rather the ethereal part of the world, because water turns into air. But that would mean I am not solid ground! Where is the ground? CB: No but it is all encompassing, with sea and sky! One last thing, could you say what your desert island chocolate would be? MP: That is very hard! But there is a new chocolate, that is not even on the market yet. It is a Pacari bar called Nube. It is the result of an exploration, I found it to be something that I really enjoy. It has a lot of floral notes. It is like a perfume that I like. Imagine a chocolate that has those notes, that would be my desert island chocolate. Soon it will be on the market. I think it is fabulous. It might not have other things that I like, like the acidity of dried fruits, but it feels like a discovery, it is very exciting.